Valentine Wolfe's latest album blurs the lines between beauty and brutality. The collision of dark magic and steampunk has always seemed a natural fit. That union has enriched video games such as Dreamfall, American McGee’s Alice, and Dishonored. Now, Valentine Wolfe has entwined those concepts on their newest album, The Nightingale: A Gothic Fairytale. Unlike the Disneyfied variants kids watch today, classic fairy tales were often disturbing affairs, cautionary tales filled with the stuff of nightmares. The Nightingale is no Anaheim cartoon, evidenced immediately by the album packaging’s stark, haunting artwork, created by Jacob Wenzcka to illustrate the tale’s lyrics and narrative segments. Valentine Wolfe’s sound is perfectly suited to this story, their signature “classical metal” style showcasing the strengths of its two members. Braxton Ballew’s often-distorted upright bass growls and seethes, driving the verses and choruses like a mighty engine, then soaring into bowed, melodic solos. The bass, paired with heavy drums and layers of delicate keyboard, crafts a foundation over which floats Sarah Black’s brilliant voice. The ethereal nature of her vocal delivery is a critical aspect of the album’s atmosphere, a perfect contrast to the heaviness below. To fully experience the album, I highly suggest listening to it while reading the story presented in its included booklet. The prose, while at times in need of a minor editing pass, pairs beautifully with the lyrics and music that form this story’s soundtrack. On to the tale…. Within a sinister forest kingdom, a malicious Lord and Lady desire a Nightingale to fill their nights with music. Their henchman is sent to retrieve her, locating her through her elegant song. He lures the innocent, beautiful Nightingale back to the kingdom, without telling her she can never leave. Ensnared and fought over like a prize by the Lord and Lady’s minions, she slowly goes mad. With a dreadful, magical machine, her captors threaten to extract the one thing that defines her: her voice. So, she must make the ultimate choice: lose herself, or her life. The album’s twelve tracks shift perspective between the various characters. Kicking off immediately with a driving, operatic feel, “Black Feathers” and “Dark Desire” take us into the twisted, conflicted mind of Asphodel, the henchman, as he alternately seeks to “terrify and subdue” or “tenderly make love” to the Nightingale. Once lured to the forest kingdom’s Poison Garden, the Nightingale herself expresses her fear of the unknown in the catchy symphonic metal of “The Place Where Evil Grows”. Valentine Wolfe performing "Black Feathers"
Soon, she is tormented by Mistress Oleandra, a competitor of Asphodel, inspiring the dread-inducing, melodic “Inside My Nightmare” and “Devil’s Bane”. The latter’s chorus—“Her stinging touch / Her icy stare / Within her breast / No love found there”—captures the mistress’ character perfectly. To spite Asphodel and advance herself in the eyes of the Lord and Lady, Oleandra covets the creature. Her torment desire to feel alive once more in a place of death is beautifully illustrated in “Darkling, Listen”. The Nightingale’s desperate “Precious Moments” has a chugging rock momentum layered with delicate bowed bass. Her lament continues in the intense, industrial-leaning “Moonlight Prayer”. The creepy, “Belladonna, Deadly Nightshade” captures the Nightingale’s desperation and madness as she seizes control of her destiny. The Nightingale’s fate is resolved within the remaining tracks, “You Could Never Have My Heart” and “Ghost of Her Self”. The album truly has the themes of a gothic tale, replete with multiple levels of symbolism. On the surface, without music, life isn’t worth living. Going deeper, you can take everything from a person, but if they still have their voice, they still have themselves. Lastly, even when you’ve lost control of your life, you can still retain control of one thing: how it ends. That’s power in and of itself. This is a dark story that, beneath its beautiful veneer, is often brutal. Valentine Wolfe again prove themselves to be fantastic, musical storytellers. If you’re fans of their earlier work, like their Edgar Allen Poe-themed Once Upon a Midnight, this album builds upon that already-solid foundation. With each album, they continue to refine their sound. Nightingale is the best-sounding Wolfe album yet (not that their previous efforts were slouches!). If you--as I do--find joy in dark music, I think you'll find much to love about this band's work. Mark Rossmore has released three atmospheric albums of steampunk-inspired music as Escape the Clouds. 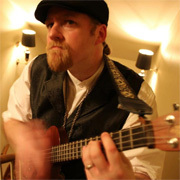 A multimedia artist who enjoys telling dramatic stories, he has self-produced three acclaimed music videos and is a published author of steampunk short fiction, aviation articles, and music-related non-fiction. Learn more about his music, videos, and writing at: http://www.EscapeTheClouds.com .